Ok, I got a 2 pin Power LED cable in a 4 pin case (like the ones you plug into the PSU, with 2 empty spaces for 2 of the pins) with just a male adapter. I also have 4 fans with the same except they're all 4 pin in a 4 pin case with male and female connectors (split to 2 connectors m/f). Do I link all of these to the psu separately (not using the female end) or do I link them all together? I was also curious why the 9 pin(with 1 useless pin) connector on the motherboard has 9 (4x 2p + 1 useless) pins and my case has the little 2 pin female connectors for PWR, RESET, HDD LED, but no PWR LED. It is instead a bigger 2 pin adapter which is supposed to be connected to the PSU?? Now just 1 more.... My 8800gtx video card has (2) 6pin power slots right next to each other, and my psu came with (2) 6 pin -> 6 pin + 2 pin adapters. Do i connect just 1 of them from the GPU to the PSU or both? If just one, which one of the GPU.. closest or furthest from the back panel? What do I do with the extra 2 pin connector? Right now I have the 6 pin end connected to the PSU, and the other 6 pin end with the 2 pin connected to the video card with the 2 pin connected to nothing. This is connected to the furthest point from the back panel on the video card. Any help would be greatly appreciated. I want to try to get all of this right before I power it up. ... in case anyone has worked with the same components. The LED question isn't that important. I mean it makes no difference in running the PC. What I really wanna know is the questions about the 8800gtx. Do I connect to both power adapters on the card or just 1? if 2, splitter from 1 PSU souce or from both 6 pin connectors to each on the card? The manual that came with the 8800gtx is horrible. I mean it's not even card specific. Put card in PCI-e slot and secure and screw in.. if there's an external connection to PSU requried, connect it. Just basic stuff. I can't see why I would connect 2 power cables from PSU to GPU. That would defeat the purpose of it being SLI ready, so why is there 2 6pin power slots on the card? Do i connect 1 to 1, or fork it and do 1 to 2 with a splitter? and what is the extra 2 pin power adapter for? 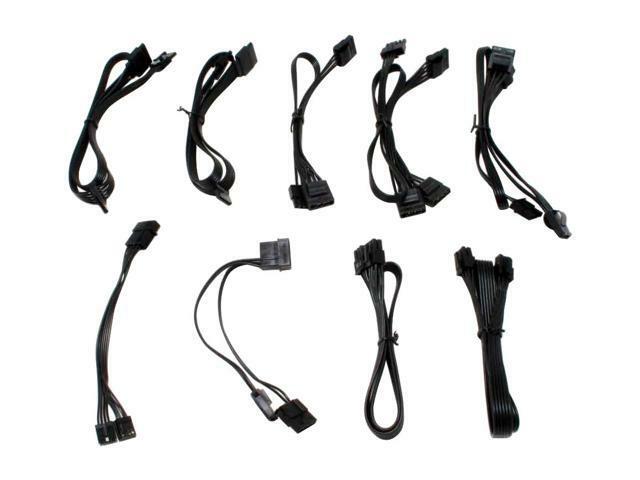 Most modern PSUs offer at least one 6-pin PCI Express power connector whereas advanced models for enthusiasts are equipped with two to four such connectors. The GeForce 8800 GTX uses two external power connectors – you’ll probably need a splitter. You’ll have a problem only if your PSU does not have a single 6-pin power connector. Can't find a 6 pin -> (2) 6 pin splitter. So only connecting 1 of the 6 pin connectors is required?? I'm confused..
(2) 6 pin PCIe Power -> LP4 splitters in the link above. What do I connect from the PSU to the GPU? ((2)) I also have a HDD and DVD-Burner (both IDE unfortunately). Can I just use the same LP4 from the PSU I was using for the fans to link the HDD, DVD burner, and 4 fans together all to a single power souce? ((3)) I got a LP4 for the PWR LED that's missing 2 pins. Where do I put this? The PWR, RESET, and HDD LED all have smaller 2 pin connectors which go to a single 9 pin slot on the board. ((4)) I got a PSU with (2) PCI-e 6 pin slots, (2) 6 pin -> 6 pin + 2 pin adapters, and (2) 6 pin -> LP4 splitters (came with the 8800gtx). How do I connect the PSU to the 8800GTX with these? Yeah.. I've read that. It's very vague and not card specific, so wasn't much help. From the picture you sent, it looks like ya got (2) 6 pin connectors coming from the main PSU that split from 1 wire. Mine only has a 24 pin, and a 8 and 4 pin for the CPU. The only splitter I have is the 6 pin -> lp4. I'll just use both 6 pin PCIe connectors on the PSU to connect to the GPU. Seems to defeat the purpose of 8800gtx in SLI, but w/e. Just booted with everything else hooked up and the 4 fans aren't working. The case came with no instructions on connecting the fans, and most tutorials I've seen talk about hooking up a 3 pin connector from the fan to the mobo, and since all of my fans have LP4 connectors (split into male and female) I just assumed link them and hook it all up to the PSU using a molex 4 pin power connector. I connect it to the PSU, and the far end to the PWR LED connector. I then connect the middle part of the molex 4 pin cable to fan1, then fan1 to fan2, etc... until all 4 fans are linked. I boot up and the fans don't start. I turned off the power right away, cuz I didn't want to overheat anything. Am I doing something wrong? Scratch that. Must've had a loose connector. All fans, LED's, everything works now at boot up. I assume the video card is working cuz I can feel the GPU fan when I put my hand under it, but I've hooked up my 22" Acer LCD monitor to each of the DVI ports, and I get no video. Nothing... I just tested the monitor on another system and it works. Any reasons I shouldn't be seeing any video? vidio card could be damaged...doh. or not put in the pci slot all the way, check it. try using a vga cable. Is it possible to connect both rgb components to one rgb controller? First time watercooling. How to connect all the components?